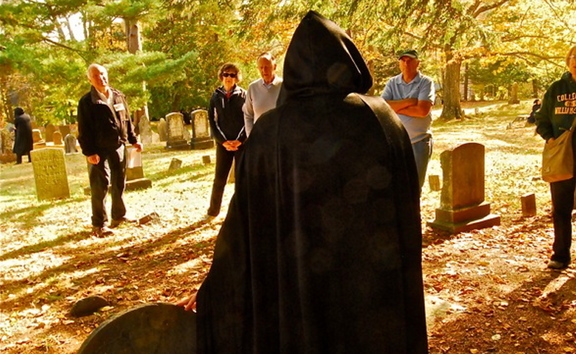 The Tate House Museum is hosting cemetery tours of the 18th Century Stroudwater Burying Ground on Saturday, October 17th and 24th from noon to 4 PM, on the hour, with the last tour starting at 3PM. The picturesque cemetery, located along the Stroudwater River, is the final resting place for many prominent members of the proud Stroudwater community. Museum volunteer “specters” will portray some of the cemetery’s more celebrated residents, telling their colorful historical tales – some quite tragic, and some with a dash of soap opera to them. George and Mary Tate are ready to tell their stories, along with the first woman in Maine to have the flags lowered to half staff upon her death, and many more. Please join the Tate House Museum for an afternoon of spirited fun, entertainment, and education. Ticket prices are $12.00 for adults and $6.00 for children 12 and under. Tickets and fall bake sale treats will be available in the gift shop, 1267 Westbrook Street, Portland, ME. Proceeds help support the preservation of the Tate House. The Tate House, built in 1755, was the home of Captain George Tate, senior mast agent to the British Royal Navy. The Tate House, a National Historic Landmark, stands as a physical reminder of the economic importance of the colonial mast trade and its role in the American Revolution.